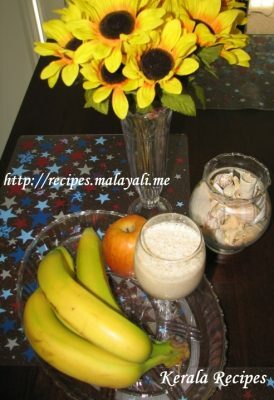 Here is a very simple smoothie recipe using Bananas and Apples. I have been trying lot of smoothies recently, since they are energizing and super simple to make. You need a nice sweet apple and a ripe banana for this recipe. Here is my recipe for a quick Banana Apple Smoothie. I had this smoothie after my workout at the gym and I instantly felt refreshed. Blend all the ingredients in a blender until smooth and foamy. Serve immediately otherwise the apples will change the color of the smoothie.